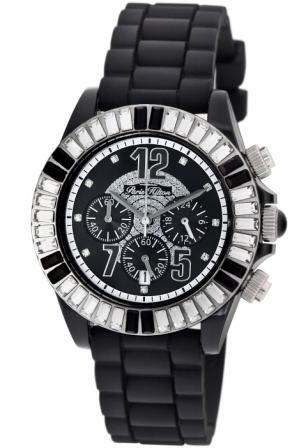 Right on trend, with this ceramic-look Paris Hilton Chrono collection – this watch boasts the popular chronograph feature, with a black strap, encrusted with crystal accents. The black case is completely surrounded by large rectangular, emerald cut crystals. The seductive, black dial showcases large bold numerals at 12, 5 and 7, outlined in silver, with the date window at 6. This watch combines sparkle and elegance for a beautiful timepiece that you can wear every day or on a night out on the town. Wear it and be wonderful!